Our youngest daughter loves mermaid's. In fact, she even has a mermaid tail blanket and has been begging me for a swim fin. I admit, I've always been fond of mermaid's too. They are beautiful and unique. I have a fun gift idea for the mermaid loving kids in your life: Mermaid Theme Scented Secret Scrapbook. I received one of these as a thank you for sharing. All opinions are my own. If your child is like mine, she or he enjoys taking pictures of pretty much everything. Our daughter has a little $10 smartphone that she uses for photo taking when we go on trips. It has a ton of photos stored on it but she wants a better way to view them, especially after our trip to the beach this summer. So we decided we're going to do some scrapbooking. After our trip, I'll print off her favorite photos - around 10. With this Mermaid Theme Scented Secret Scrapbook she can embellish her photos with fun stickers and tape and she can do some journaling with the feather pen. This kit includes a zipper pouch to hold all the accessories. 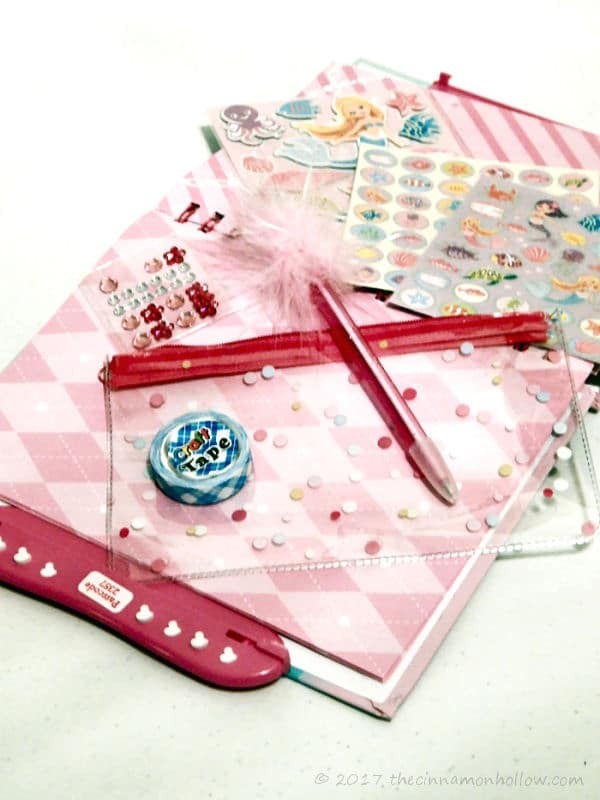 She stores her pen, stickers, tape and small photos inside. And it's all scented! Smells good too. Her favorite part is that the scrapbook locks. It comes with a code and all you have to do is push in the correct buttons to unlock it. She loves that she can journal in her book and only she will know what is inside. It's cardboard and plastic so it does feel a bit flimsy and the locking mechanism is sometimes a little hard to push in but she seems to love it regardless. She said that because I also love to scrapbook, that I get to see it when she's done. I can't wait to see what she comes up with! I love that it gives her something fun to do on rainy days or even while we're on our trip! It's small so it will fit right inside her travel go-bag. When she is ready she can take it out and draw, write and add photos. 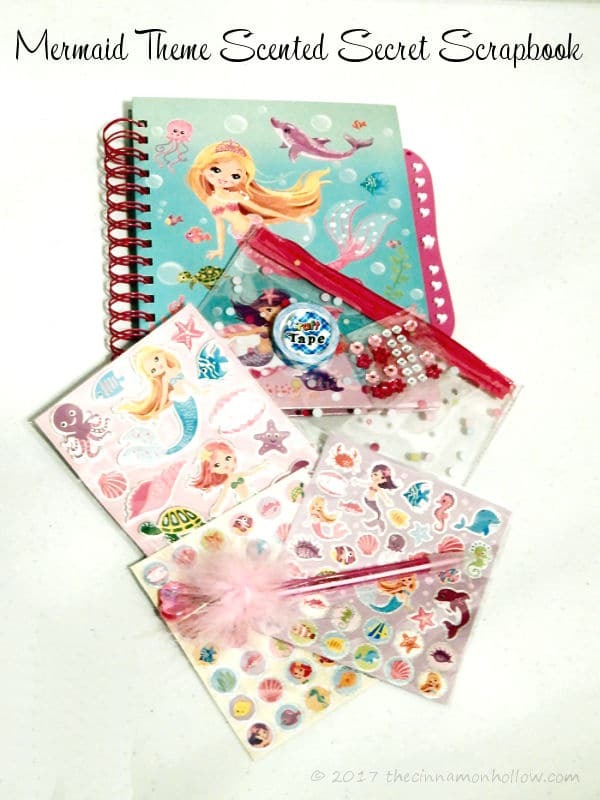 If you're looking for a fun, unique gift for mermaid fans, this pink Mermaid Theme Scented Secret Scrapbook is perfect!